There will be 2 full conference days with keynote talks and multiple parallel sessions on Wednesday & Thursday (October 26& 27th), and a Training Day with workshops and tutorials on Tuesday (October 25th). The registration fee includes coffee breaks and lunch, but do not include VAT (27%). For groups consisting of 4 or more people, we offer a 25% discount from the Standard price, irrespective of the registration date. Please note that only one kind of discount could be applied to a ticket purchase. 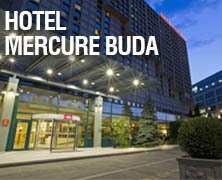 If you need accommodation for your stay we can help you to book a room at the venue, the 4-star Hotel Mercure Buda. Room rates are around 80 EUR/night, including breakfast and free Wifi. For cancellations made by September 15, 2016, the full registration fee will be refunded. 50% refund will be given for cancellations made between September 15 and October 15, 2015. No refunds will be given for cancellations made after October 15, 2015, but the registration can be transferred to another participant within your company. Hungarian companies and individuals should register on the Hungarian site. For additional ticket types, P/O orders and any special request, please contact us!